Posted on October 11, 2017 by Elizabeth E.
I hope the combination of the above three piques your interest, for it was an interesting juxtaposition of quilters. We also had SAQA in the same space, as well as Mirjam Pet-Jacobs, with her pieces on wastefulness. These artists were all in the Space des Tisserands, a large room that had been subdivided to accommodate all these quilters. While some of these pictures are tiled in groups, you can click on any individual image to see a larger version. First up is Ian Berry. Yes, he’s the blue jeans guy. He cuts up blue jeans into shapes and tones and colors and contrasting pieces, then re-assembles them via gluing, into recognizable images. We had a few minutes before the crush of fans wafted in again to visit with him, and found him a lovely conversationalist. We talked about quilting, what else? Then he was called in for a group picture, one of many I saw him do that day. I wish I would have snapped the photo of the group of ladies posing on the blue tiles in front of the washing machines in the laundromat. I didn’t know you could step into a work of art that way, but no one was stopping them. Next up is Luke Haynes (self-portrait, above), who burst onto the scene about three years ago, and remade the quilt world into his world, by utilizing traditional art studio techniques. This means that he uses assistants to do the work, but they work under his name, and in this way he mounted his Log Cabin show. 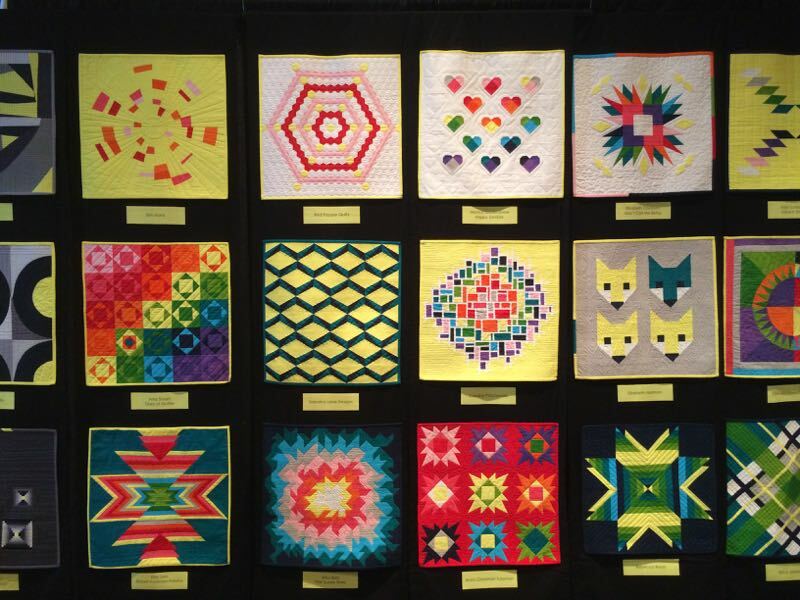 At QuiltCon 2016, some quilters weren’t too happy with him, for to them this smacked of the subsuming of “women’s work” into the male creative world. But Luke is a happy guy (really fun to hear him talk, and I admire his creativity) and he then morphed into this show (of course, this is all MY view of things–he may have a different take), which was called a collaboration of quilters. Or Quiltllaborations, as his exhibit was called. Fourth Row (L): Untitled It is one of my favorites, so please click on it to enlarge; however, it is not quilted. Still cool, though. Fourth Row (R): Another wedding ring, but I didn’t find the title card. Some of his were nearly on the ground, or around a corner. Nancy Crow, who helped co-found the Dairy Barn (in previous post) also had a few quilts there under her name; I assume they were either colleagues or students. One of my fantasies in my younger quilting years was to travel to Ohio and take one of her two-week classes. I have just about every book of hers, and screwed up my nerve to read her class supply list. I was completely intimidated and decided that wasn’t the direction I’d be going. But still, she is one of my Quilting Fairy Godmothers, although she probably wouldn’t like me calling her that. (She is a serious quilter–she has a quilting studio with multiple GIANT design walls, scads of tables holding yards and yards of fabric). Serious. Thirty-four? by Helen McBride Richter (USA) 75″ wide 70″ long Did I mention that the name of this exhibit was Mastery: Sustaining Momentum? 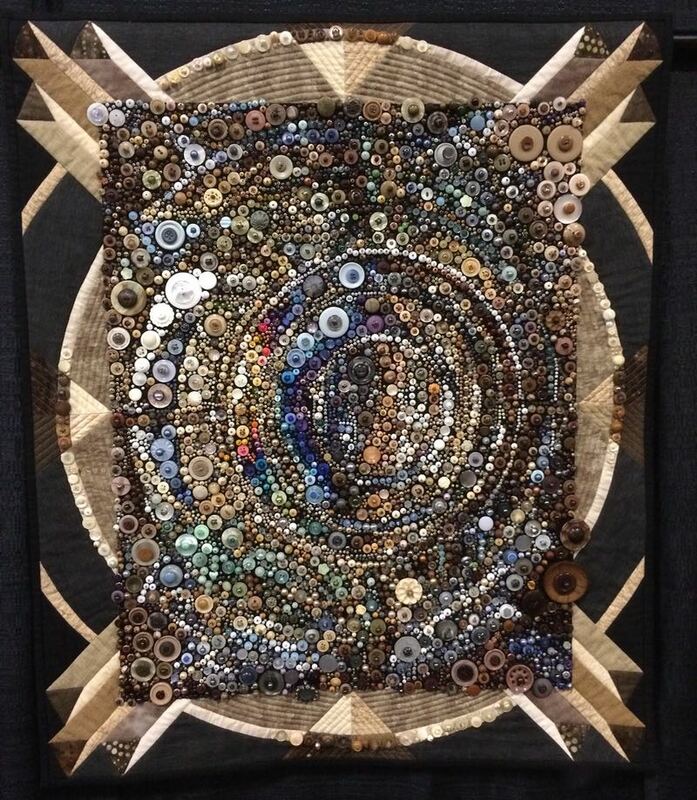 Colleen Kole’s Time Fragments #11 In the Distance (USA 2015) 82″ wide 83″ long Detail is below, that shows the really interesting quilting. Okay, I didn’t love this exhibit of Mirjam Pet-Jacobs, with her pieces on wastefulness, but that could have been just my mindset, or how things struck me that day, for she is a talented textile artist with many exhibits on many different topics (please visit her website to see the range of her artistry). Her exhibit was called “What a Waste!” The above (on the floor in the middle of the gallery) is the waste that came out of a creative quilt studio. [Update: She wrote to me to explain that this was a three-years accumulation, which made it feel more real, for after three years, perhaps my waste stream would be the same?] Perhaps I don’t like to be reminded that there is lots of waste in quilting, and how many of us donate doggie beds full of scraps to our local humane shelter? My hand isn’t up. I try to recycle my scraps, using them, sharing them. But I do know that our textile has long been known for waste–just type in “waste in the textile industry” and see the listings. We try to ignore all that. Maybe the way it was presented to me just didn’t make my heart leap? Or maybe I don’t want to know about this? Does our cycle of quilt fabric collections — almost too many to keep track of — contribute to this waste? You can see that it caused me to think. Also in this building were the quilts from SAQA–Studio Art Quilt Association. They never let us photograph their quilts in stateside shows, so I felt positively delirious to be able to take photos of these quilts. That’s in the next post about the European Patchwork Meeting. I have created a main page, with a listing of posts. Posted on October 8, 2017 by Elizabeth E.
I am recapping, in a series of posts, my experience in visiting the Carrefours European Patchwork Meeting, in the Alsace region of France this past September. In case you came at this topic sideways (which is usually how the internet works), I have created a master post, with links to the exhibits. 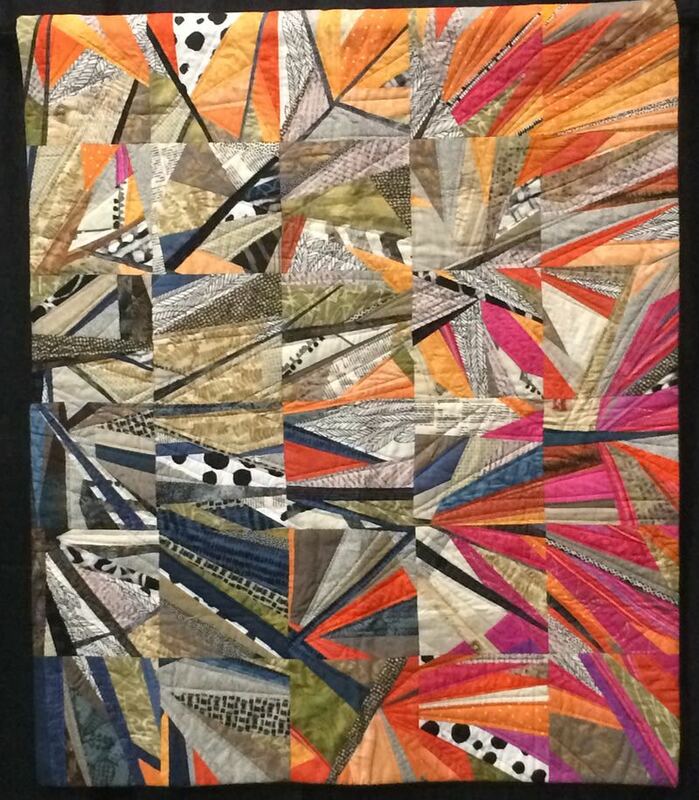 After visiting the vendors, and Gabrielle Paquin, the next quilt exhibit we went to was the best of the Contemporary Quilts B collection from Quilt National. They have several groupings of quilts that travel, and since their European partner is this show, we were lucky to see some of these quilts. 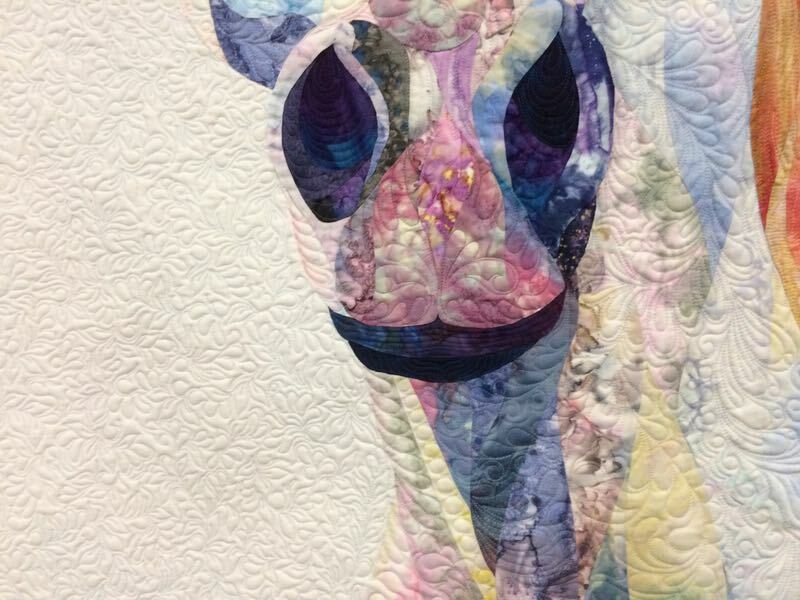 If you don’t know about Quilt National, whose headquarters are in a former dairy barn in Athens, Ohio (above), you might want to read more about them. 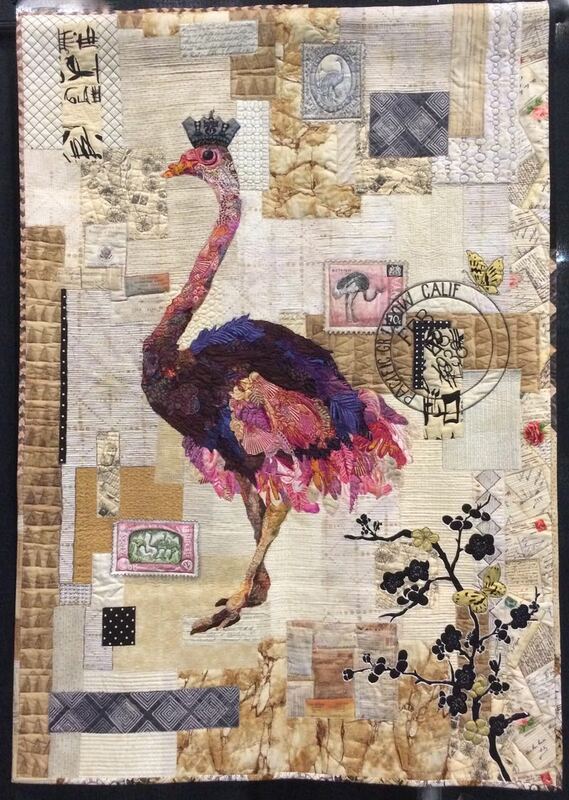 Suffice it to say that their quilts are more artistic, less traditional and always intensively creative. The exhibit was in this site, with its half-timbered walls. Inside it was very modern. Jayne Gaskins’ Memories (USA, 2014) paid homage to a street scene from somewhere in the Andes in South America (I assume), and was heavily thread-painted. Detail is below, where you can see the dimensionality of this piece. Skylight by Elizabeth Busch, USA, 2014. Those spatters looked like dye discharge, and I wondered how she did it. It may have also been a batik-like process where she dyed it, then blocked it with a wax resist, then over-dyed it. As this exhibit had no title cards, there was little information to go on. This piece was quite large; I assume each panel to be about 20″ wide and 40″ long (couldn’t read the dimensions when I got home). It’s titled Entropy, by Kathleen Loomis (USA 2014). I loved her use of striped fabric, not only to subdivide the sections of fabric, but she also used them like Gabrielle Paquin did, as a way to get texture and design into a flat area but without using floral or other motifs in the fabric. Detail, below. Rough-edged and exquisitely hand-quilted, Kate Gorman’s A Keeper of Secrets and Parakeets was a quiet, subtle masterpiece. Amaryllis Set, by Jill Ault (USA 2014) appears to be multiples of the same photograph, printed on a fine fabric, then cut as to reveal different colors and shading. Detail, below. Okay–is this a quilt? Straps with paint and grommets on a tinker-toy-steel-rod grid? Diane Nunez’ Cross Section (USA 2014) certainly makes me wonder. Roofs of Mumbai, by Jean Renli Jurgenson (USA 2014) was interesting because of the materials used: some stiffened, quilted fabric and some was non-woven, almost paper-like. Details, below. 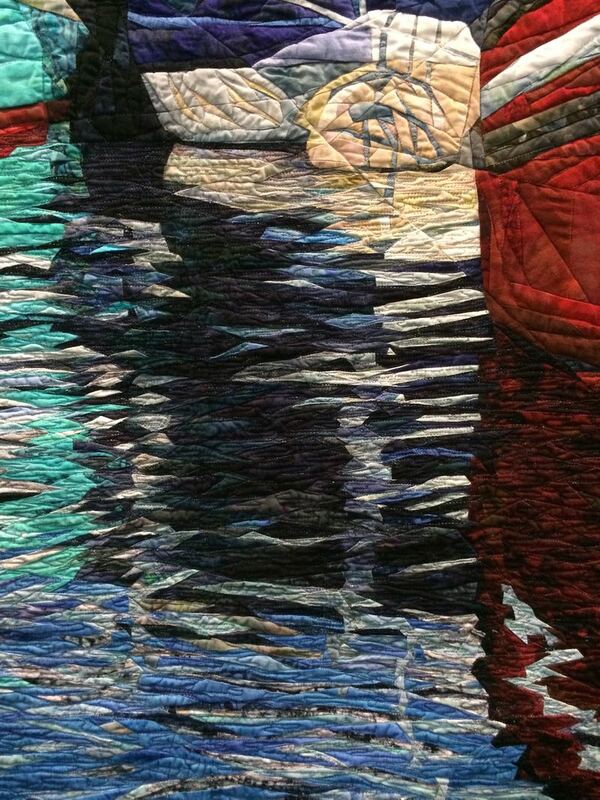 I’m not usually drawn to the deep, dark, moody quilts, but her construction and the material she used was compelling. (See detail below for the small knots she used for keeping the layers together). Judy Langille’s Nocturnus IV (USA 2014) is about 35″ high by 47″ wide. Maria Shell’s To Agnes Martin with Color (USA 2014). Now I know what to do with all my scraps of solids. Again, I put my hand up for scale. Those crosses are tiny! This has got to be one of our favorites. Janet Windsor’s Crumbling (JP 2014) looks like stream bed with multi-colored stones. It looked, upon closer inspection, that they were wrapped fabrics around puffiness with a cardboard backing? Some stones looked like they’d had some color applied, but that could have just been the fabric. Talk about a quilt that you want to touch–this was it. Morning Walk, by Joan Sowada (USA 2014). I left it uncropped so you could glimpse the exhibit’s layout on either side. Conflict No. 5 Mugging, by Judy Kirpich (USA 2014) made me wonder if she was had been the victim of a violent crime, with its shards of red and ominous, oppressive sky. 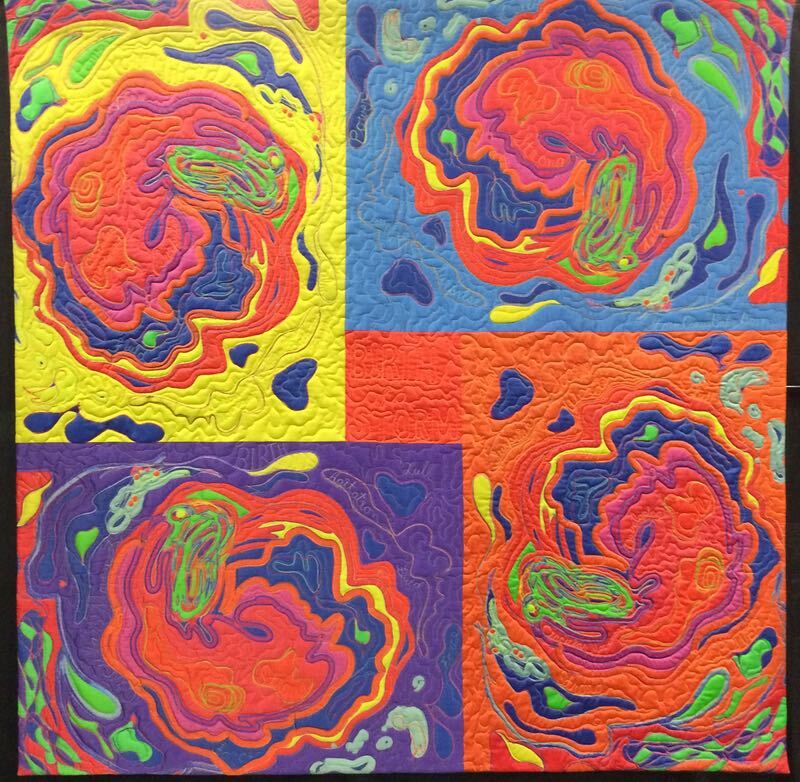 The quilting (below) was outstanding, expressive. Cecile Trentini’s C5–Red Circonvolutions was Picasso-esqe in its design, the quilting providing all the texture and interest. Central Park West Winter VII by Linda Levin (USA 2013?) This was large (can’t read the dimensions) but mostly it looked like a very cold and blustery day, writ in fabric. Posted on September 30, 2017 by Elizabeth E.
The poster above links to the numbers in the map. Once we left the L’Espace Commercial, we walked across the street to the Theater, where two sets of quilts curated by two different women provided a study in contrasts. One set of quilts, by collector Mary Koval, was exhibited on the ground floor of a beautifully restored old theater, which you can just see from around the edges of some of my photos. This set of quilts were all American antique quilts. “Trained at Met Penningen’s Higher School of Decorative Arts and Interior Architecture. After twenty years in the world of fashion as a textile designer, Léa Stansal decides to explore and deepen more traditional aspects such as patchwork and embroidery. Is this the artist? I don’t know, but I did love the quilt behind her head. None of these are titled, and it flattens them out to put them on this digital medium; I wish you could have seen them in person. They were wild and embroidered and free and filled with a happiness of creativity. 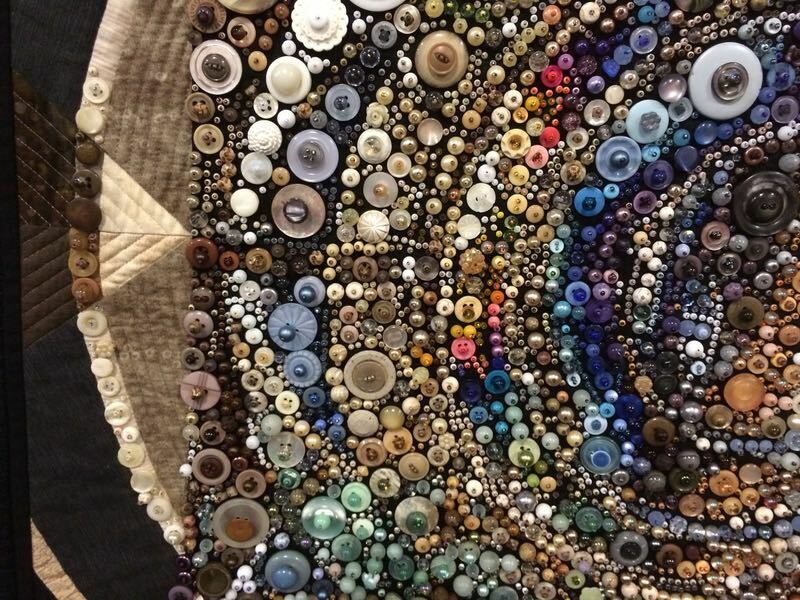 I think if I could spend 10 minutes in her studio, I’d break all those Rules of Quilting that I carry around inside me. I kept thinking about how the Pied Piper had charmed all the little tin soldiers. Was this a statement about war? About peace? I’ll never know, but I’m still thinking about it. Detail from above. The layers! The collage! The broderie perse! I kept sighing. I love how the deer and its antlers are in this piece, but not in the static, overused version we see in America. Shall we turn some quilts on their heads? My husband, who loves symmetry in all its forms kept sighing, too, as he admitted that this just wasn’t his type of quilting. Mine, neither, but I kept admiring that freedom to create, a freedom that was a delicious anarchy of cloth and threads. I had carefully included the identifying titles in my photos, but back home, found I couldn’t read them most of them. The quilts range from the late 1800s to the early 1900s. Pickle Dish quilt, from the 1920s. I liked the juxtaposition of these two–the orange-clad guard and the riotous early-American quilt. I liked the embroidery detail on this little Uncle Sam. a quilt from the 1920s. One of my favorites of the antiques because of its exuberance. The name “Rev. and Mrs. (?) S. Harvey” is on the first line, with “Park Methodist Episcopal Church” on the second. “Circle No. 5 1937” on the third line. We weren’t allowed to touch the quilts (of course!) so I held my hand up to show how tiny those triangles are. This quilt is from Berks County, Pennsylvania, but I don’t have a date. I’m sure all these quilts are from their new book. Info can be found on their website. Now we were hungry, so we found this little “cafe” in the back of the theater, with fabulously dressed servers. Although the flowers were pretty tired, I loved the attempt at patchwork on the vase, with bits of cloth glued to the glass. And this, folks, was the traditional Alsace salad with bretzel (with a “b”). My husband ordered this, but I went mainstream with the ham sandwich (below). They were doing an active business, so we hurried and ate and went back out hunting quilts. Note: this series about the European Patchwork Meeting has a main page, with a listing of posts. 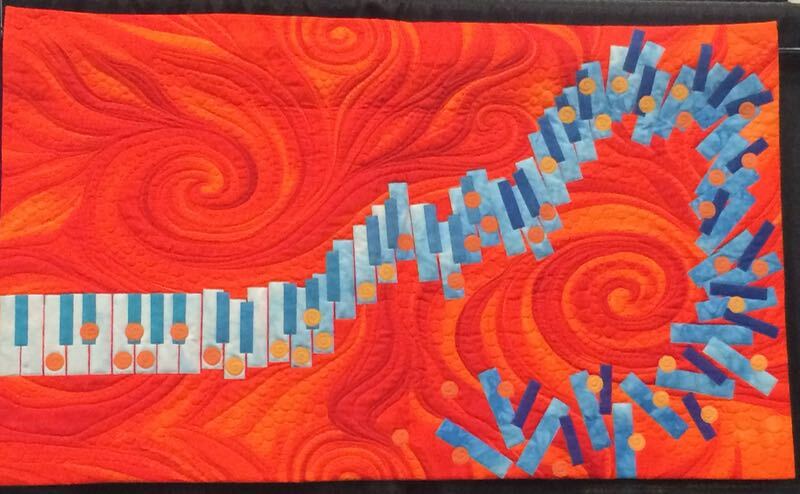 Posted on January 23, 2017 by Elizabeth E.
The Road to California Quilt Show was held this past weekend, and I think it was my 22nd year of going…or something like that. 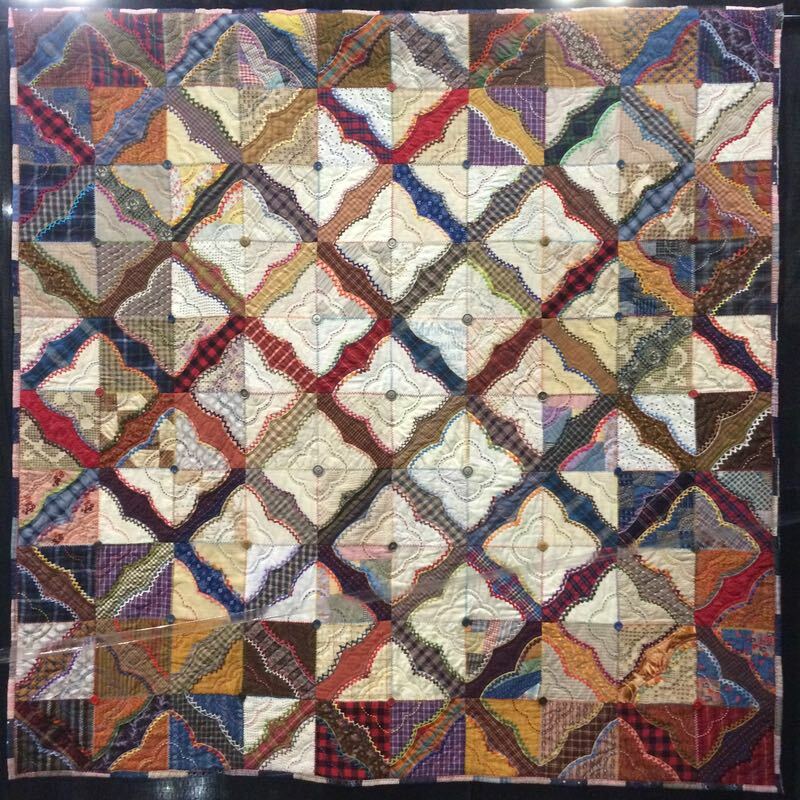 The highlights for the first day are found on my Instagram Account ( as well as some found in #roadtocalifornia2017), but here are quilts that I didn’t post up. This was the gallery for the Art Abstract quilts, and yes. They were abstract. Sometimes it’s helpful just to see how they are laid out. Birth of a Storm is by Betty Hahn, who used the “color and movement of the Doppler radar forecasts of tropical storms” as her inspiration. Orange You Glad I Got the Blues? is by Mel Beach, representing the “influence of improvisation within Jazz music. The tape keeping people out was placed too far out this year, so the only way I could photograph these horses was side-by-side. 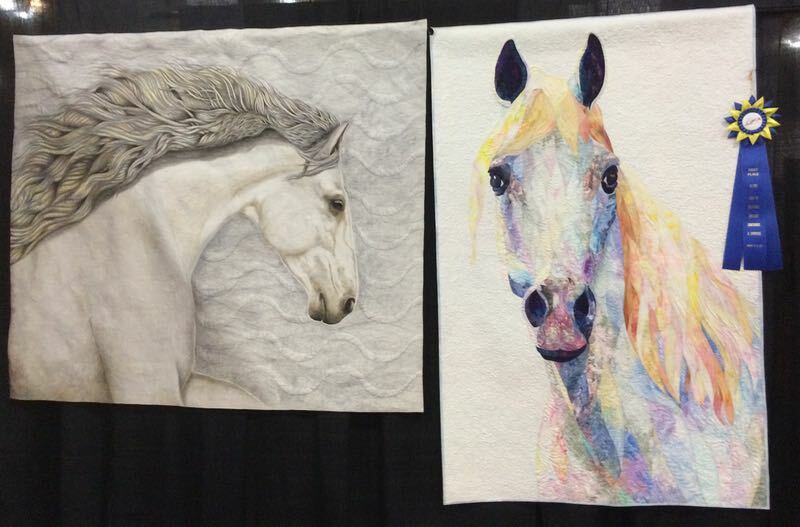 The one on the left is White Knight, by Patt Blair. The one on the right is Wendy Knight’s Here’s Looking’ at You. 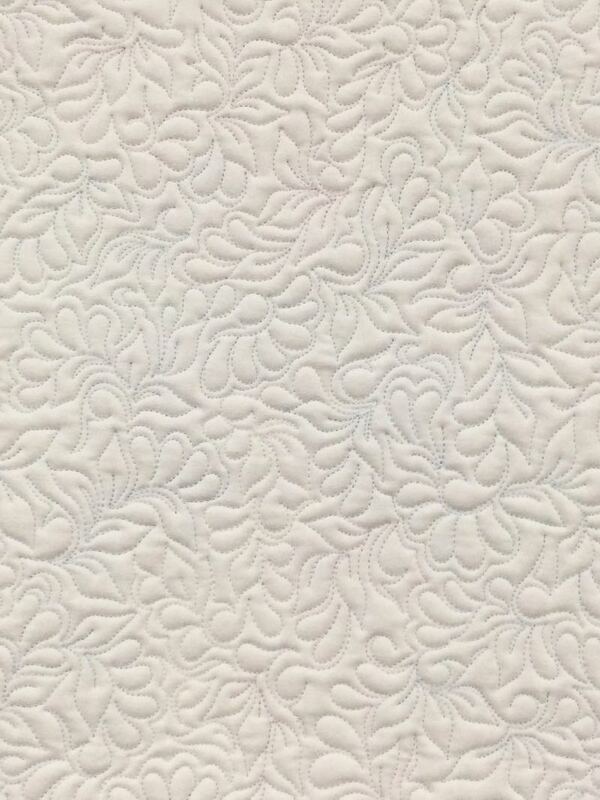 I was mesmerized by her quilting, shown in the next images. 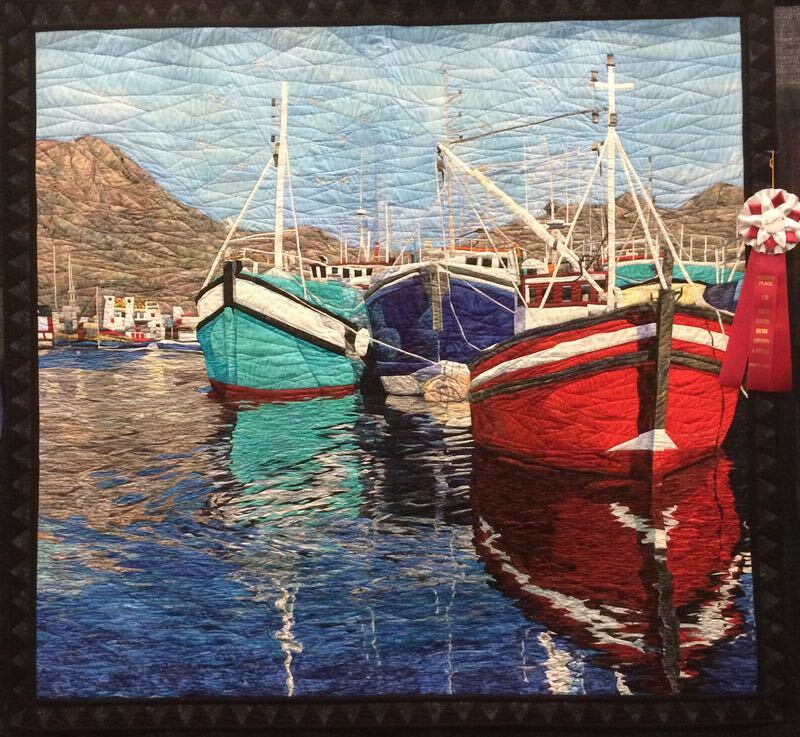 Cynthia England’s Reflections of Cape Town took a year to make and has about 8400 individual pattern pieces in it. Detail of this is below. 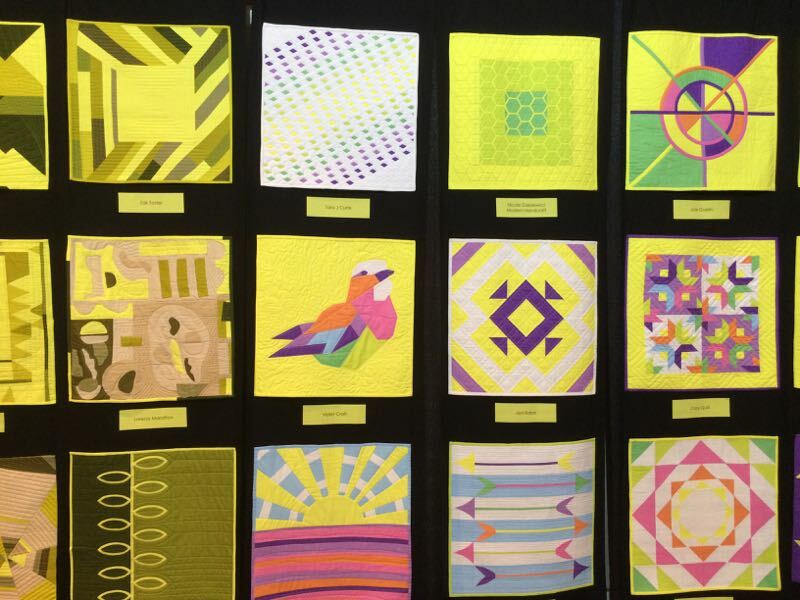 Kona Fabrics had a series of small quilts (around 16″ square) using that bright lemony yellow from last year (above and below). There was also a wonderful exhibit by Cherrywood Fabrics of Lion King, but I could never get a good shot at it as people were always looking at them all closely. 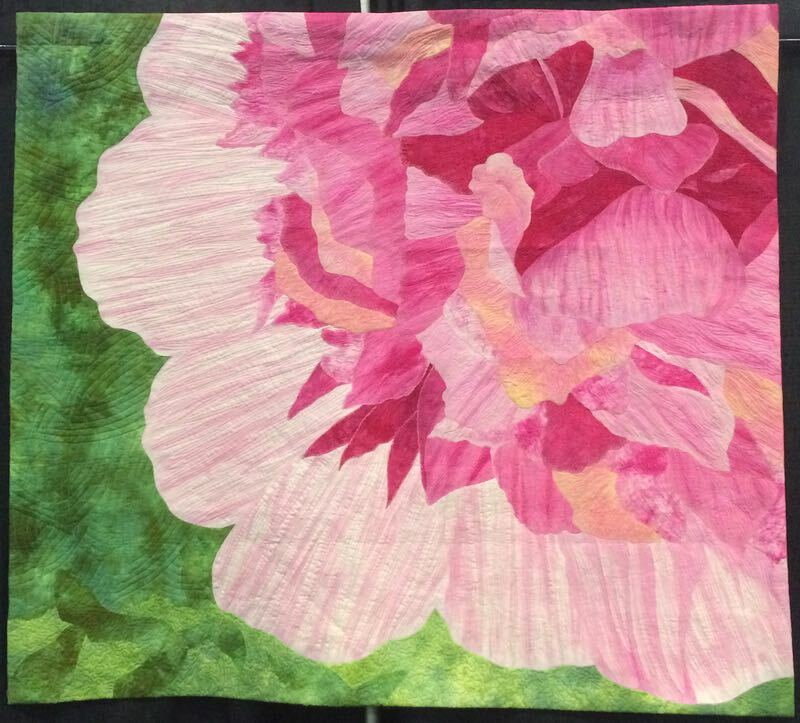 Peony, by Sarah Ann Smith, is a stunning blossom interpreted in fabric. 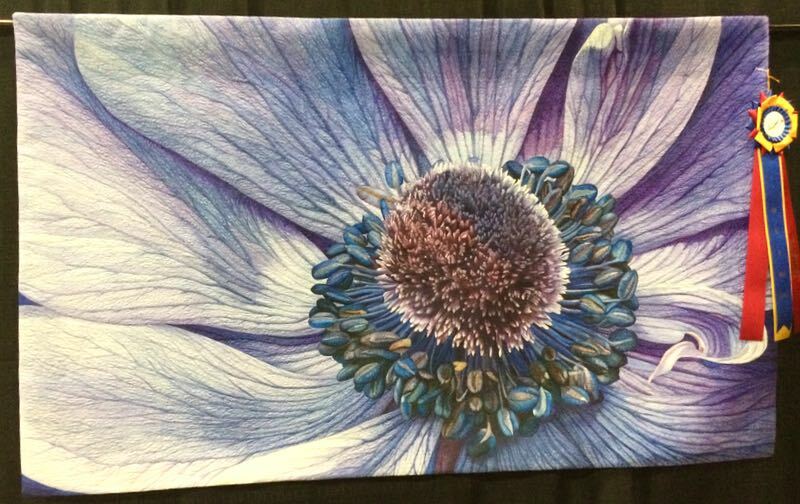 But I couldn’t help constrasting it with the bluesy-purpled Blue Anemone, by Andrea Brokenshire, admiring its use of periwinkle, turquoise and other colors, and that exquisite quilting. Overall impressions (including these and the images on Instagram): thankfully the use of sparkly bling has fallen to new lows, with the few quilts that did add crystals keeping them to appropriate usage. Margaret Solomon Gunn’s quilts (here and here) are always exquisite, and I realize that I’m never going to measure up to her long-arm quilting skills. In fact, I heard the moans of “I’m not good enough” over and over. Aside from the usual don’t-compare-yourself-to-others cliches that I could offer, I say the only good remedy for that one is to go home and make a one-patch quilt and have something to show for your time, and that will allow you to realize that every quilt has a beauty all its own. 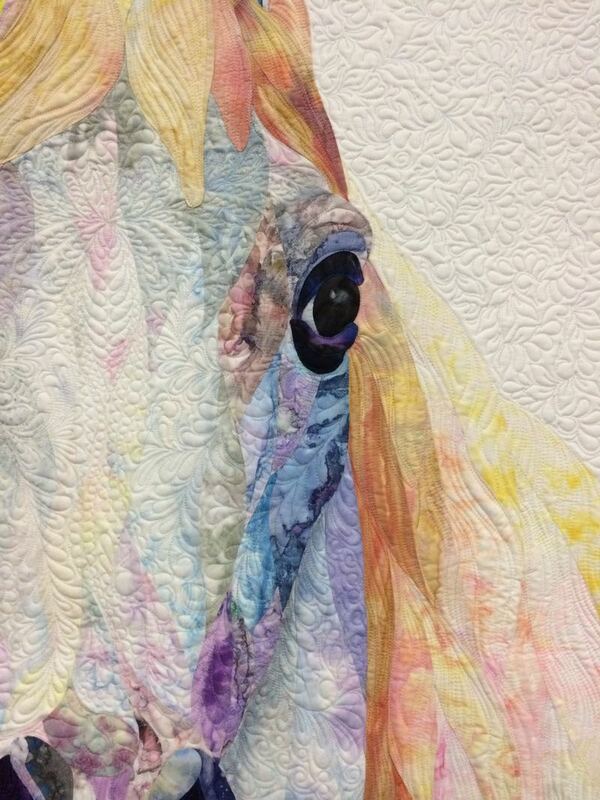 We have quilt shows to admire the best of the best, and the others and to use them to inspire us. 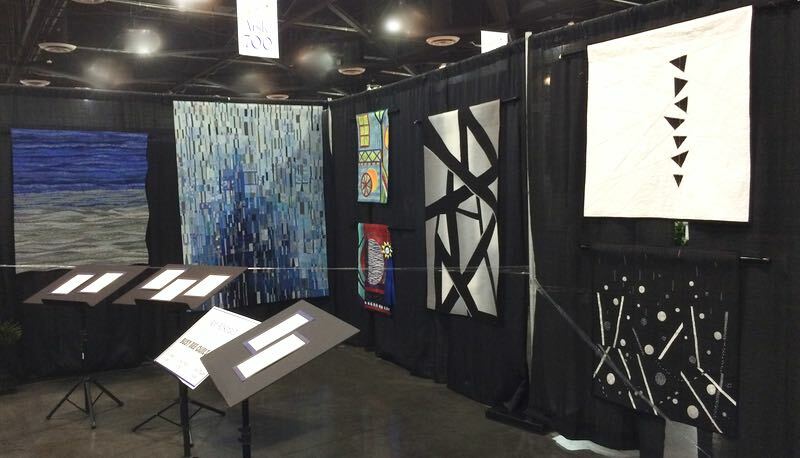 I was very happy to see my friend Simone’s quilts hanging in the show (here and here), as well as other people I know. Those friendships are what tie us all together in our quilting community. I didn’t choose a “Most Ugly” quilt this year, although there were several that might have qualified. And I’ve decided to change that award to “Didn’t Live Up To Its Promise” so as not to offend. I took two classes; one was awesome and the other — even though the teacher was so nice and knew her stuff–not worth it. Why? Because they sent a long-armer to do teaching about quilting on a domestic machine. And because they made us use machines that were difficult to use, and we spent a ton of time re-threading them, fighting their built-in stitch regulators and waiting for the tech to come. And because when we showed up, these complicated machines were not threaded or ready for sewing, so we spent nearly 90 minutes of class time getting them up to snuff. One last gripe: the practice of teachers charging us Beaucoup Bucks for our “kits” of materials that we have at home, for supplies that we already own, and for threads that we don’t care to try. Unless it’s some specialty item that we wouldn’t think to buy, I’d prefer a teacher include a detailed supply list for us to bring. Yes, we will buy the teacher’s stuff in class if we forget ours, or hunt for it down on the vendor floor, but I now have another blue marking pen, two spools of thread that I probably won’t use again (I’m a Superior Thread fan) and a 18″ by 44″ marked quilt sandwich. Those three things cost me $45 (!). I like having such a high-quality show so close to me, and I enjoy seeing my “yearly” friends. I heard lots of gripes about no printed showbooks, the cheezy Road to California bag, and no lanyard-style name tag holders (and no, I’m not buying their blue Road badge holder), but I think we were all happy to be there.